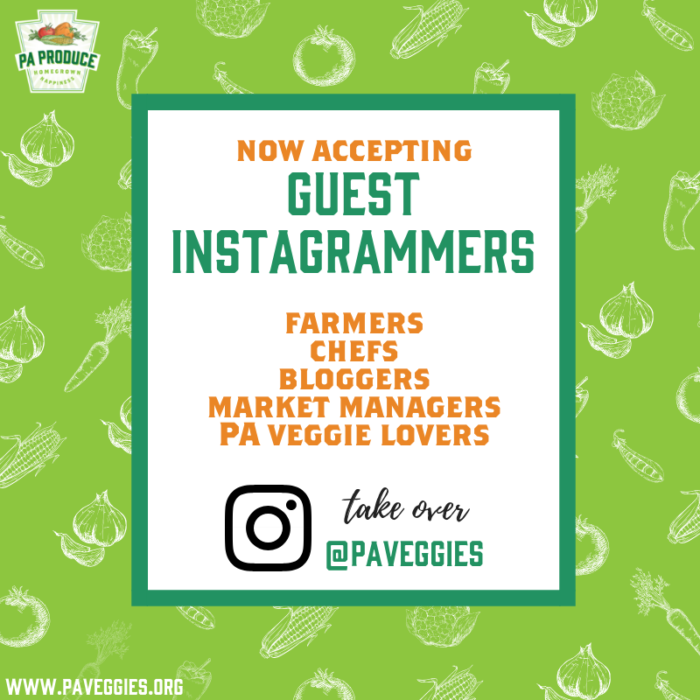 The Pennsylvania Vegetable Marketing & Research Program (PVMRP) is on Instagram as @paveggies and we’re always in search of fellow local food professionals and Pennsylvania vegetable lovers to take over our account, educate, and share their story with our audience through photos, videos, captions, and hashtags created uniquely by YOU. Once you’ve submitted your form and have been confirmed through correspondence with the PVMRP, we’ll grant you access to our login credentials (unless we’re taking over your account, which we also welcome). We’ll provide you with a few easy to follow guidelines and tips, such as using the hashtag #paveggies in each caption. Simple stuff! We’ll provide you with a Guest Instagram Announcement Graphic to share on your various marketing channels, letting your fans know they should follow along for the special occasion. We will also announce the takeover on our platform and tag your account, so you’re welcome to simply re-share that post as your announcement. You’ll use the agreed on period (one day or more) to share at least 5 posts per day (videos, photos, stories, and/or graphics) and corresponding captions. We will not require content to be reviewed in advance as we wish for the experience to feel as organic as possible for everyone engaged. We suggest entertaining and educating the audience – not selling or preaching to them. Feel free to extend more content to the Instagram Story as well. This is your time to shine, so share in a way that you feel most comfortable. Are you interested in becoming a Guest Instagrammer? Take a minute and complete our Guest Instagram Form. Are you an Instagram novice? Don’t let that stop you from applying. We’re happy to provide you with guidelines and tips so you can make the most of your Guest Instagram experience. If you don’t have an Instagram account, consider this the perfect opportunity to jump on the bandwagon and set one up today.